Hmmm. I'm right on the cusp there. I was born in August 1954 so I am still 64 years old. Growing up was not so warm and cuddly for me. Cuddly today are my two large hounds. I never met my Great grand parents and in fact only knew one Grand parent. Both my Parents were the youngest in their families. And unfortunately many of my relatives were obnoxious FMs. I will not indicate which here. It seems both sides of my family when growing up were relatively poor and it seems took few photos. I've seen very few prints of my parents generation of relatives. My parents moved from NY State to CA around 1950 so I grew up with few cousins or aunts and uncles around. As noted before, many I was better off not knowing better. When I was born my parents had an Argus Seventy-five 6x6cm (620 film) TTL camera. Really basic. I still have the camera to this day. Once I was old enough I more or less became my immediate family's photographer. First with the Argus and latter with my own Kodak Instamatic 104 (126 format) camera. My parents used it too I found. I too prefer paper books to reading screens. My wife (60) actually likes pod-casts and the like a lot. And reads "books" on her SmartPhone or Tab. I like collecting and listening to CDs, LPs, and CSs. Only use the PC for finding and compilating OOP music I can't otherwise find or "try" a new artist to see if I like it enough to buy. I like the physical items. Along with that I do print photographs I've taken that I really like. Viewing on the monitor is just an intermediate step to me. But, yes, for the most part the "kids" today are happy with a virtual digital life. And of minimal Quality it seems. They probably have no idea what 12" woofers are. Let a lone a 4x5" camera! I am going to be 69 soon. I have been a professional photographer for the last 20 years and now retired. I am a huge fan of the new digital photography technology and all the incredible benefits it offers. With that said I must agree 100% that the old pictures that were taken during the film days still offer me the most memories. When I look at the faded pics and feel the old crispy paper it brings back memories that I can never get looking at a computer screen and or smartphone. I remember the excitement of going to Walgreens to pick up the prints and seeing what I had waiting for me. Its still the same, I take pictures, so I can print them, did that in the 60's and doing it now, so in that regard, nothing has changed! Actually I have way more analog feedback now than I did back then! That's why I still make a hardcopy photo album. Now the album is full of prints of photo collages of digital photos, with digital text added in place of handwriting, but I still sit down to share it with family and friends, including my very tech savvy grandniece, who seems to really enjoy it. It also forces me to tell the story in only a page or two; film was expensive and those old albums didn't have 157 snapshots of the family vacation. If they like it, and want more, then we get out the laptop with all the photos. This is a great thread. I was born in 1952. When I look at B&W prints from my childhood, I remember standing for what seemed like an eternity while my dad took light meter readings and then finally had us pose and took the shot. They are awesome. He shot medium format, having done some war photography while in the Navy in the South Pacific. Later, at every holiday the extended family would get together (called a Gathering) and the climax of the evening was 90 minutes plus of viewing slides (called a Showing). The millennials are not a total lost cause. My son and his wife routinely go on shoots with me, my son using an aging T2i that I bought for him quite some time back, his wife using a T5i that he purchased for her. I'm 69 and I remember pretty much the same type family get-togethers and the albums and shoe boxes full of pictures too. That was a wonderful time and it really doesn't seem the same now. 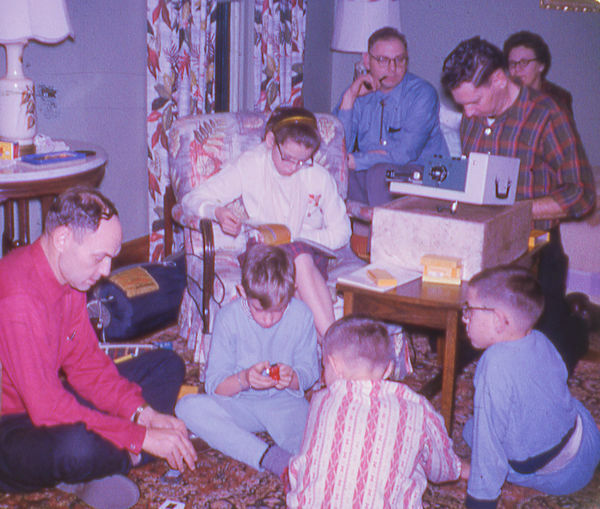 I also remember in the 1960's we also broke out the old 8mm home movies too along with all the pictures. My kids still got a taste of the way it used to be because I had lots of albums my wife and I made up along with my parents and my grandparents that were still alive when my kids were young. My kids took some pictures with film cameras but then as they got older they started taking mostly cell phone pictures now, that seldom if ever get printed. It is my grandchildren that start to miss out. I guess i am fortunate. My two kids, now grown up with families of their own, are very interested in our family history and all the family images my brothers and I have digitized. 3 - 4 generations worth. Although my very young grandchildren arent interested yet, hopefully they will be when they are our age. We werent really thinking aut these things until we were in our late 40's early 50's. About this time the family elders were starting to die off and the younger generation started to feel their mortality. While there is no doubt that technology has improved some aspects of life, as a sailor and boat builder, wooden boats ( I have 3) are far superior to fiberglass (tupperware) boats, sail is better than a motor, and I long for my old 1959 Plymouth Savoy with the flat head six and big fins. 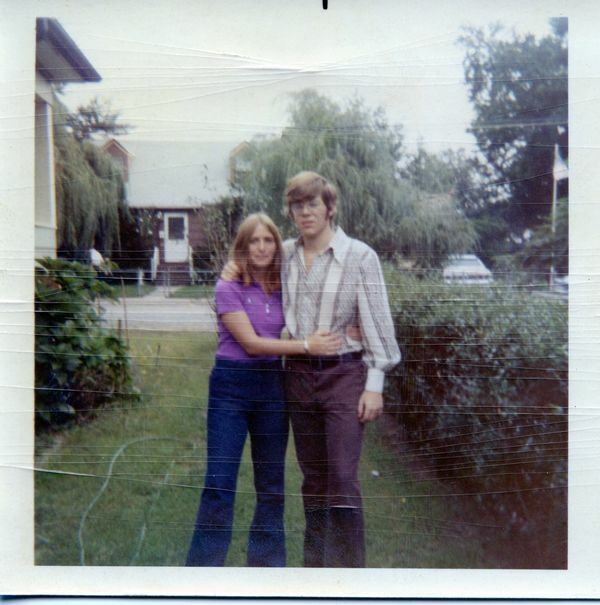 Sold the car in 71 , married and kept the girl for 45 years (or maybe she kept me)! There is alot to be said for modern things except they lack soul. Oh well... another curmudgeon here. 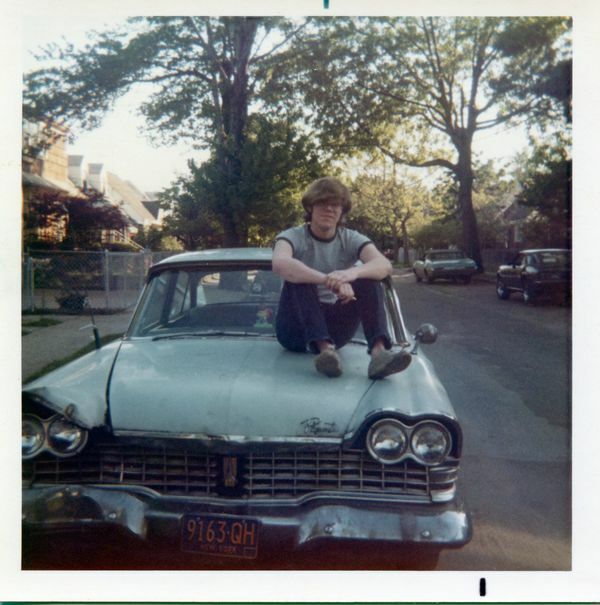 The photos are from summer 1971 before I enlisted in the Navy. Great thread! Brings back a lot of memories. We used to gather at my grandparent's every few years. My grandfather had a stereographic/3D camera and had hundreds of those 3D discs that we used to watch while wearing the glasses to see them correctly. We saw trips to Norway and trips out west along with family photos. Then my uncles & my dad would show slides. Good times. I believe the photo below is from 1958. My dad died in 2012. I have boxes of slides and albums of prints but I have ZERO of his digital images.